Choosing a flower girl’s dress needs attention as the bride‘s gown. You must make sure the little ones look stunning just like the bride. Avoid a long gown: flower girl dresses are mostly short to avoid her from falling all over the place because it can be messy. Ensure you go for a dress long enough for her to walk comfortably. Do not order the dress so early: children grow up so fast when ordering the dress ensure you do it a date close to the wedding day. If you buy it earlier chances of it not fitting are high. Purchase the dress close to the wedding date as possible. Do not pick the dress without her presence: If you have older flower girls most know types of dresses to make it easier and for them to enjoy the day tag them along when shopping. Bringing them along when shopping creates a bond between the bride and the flower girls and on the wedding day, it will run smoothly since a bond will already be existing. Don’t settle on white as the color of the dress: Most brides choose white as the color of the girl’s dresses but that is just tradition be unique and choose a different color but one that is among the marriage theme colors. 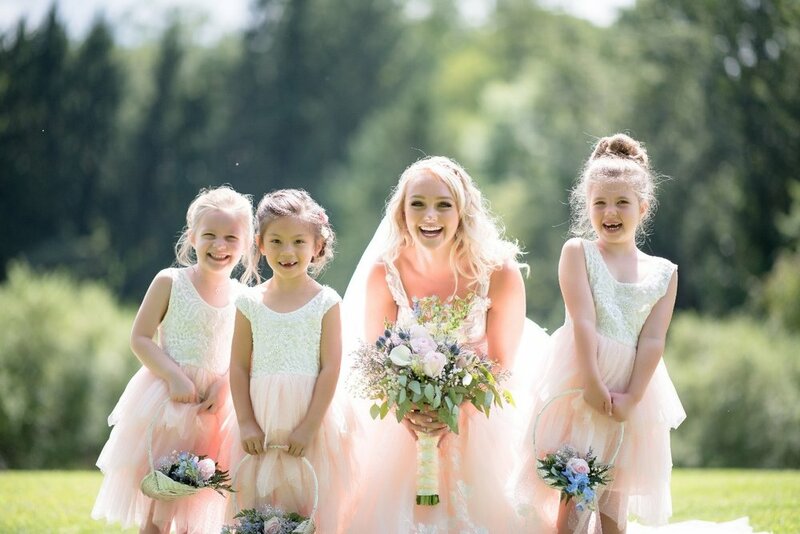 The flower girls dresses can match with the color of your bridal team outfits. White gets messy easily when worn with kids. Avoid a well-fitting dress: purchase a dress that the little one will grow with. A dress that can be worn on different occasions with this, the little girls will never forget your wedding. Consider the weather: Most brides make the mistake of not considering the weather when choosing flower girl's outfits. Choose long-sleeved if it’s during the cold season and short-sleeved if it’s during summer with this the girls will be comfortable the whole day. Additional sweaters and scarfs at a wedding bring an ugly picture because not all scarfs or sweaters match the wedding color. Flower girls add glamour to the wedding. It’s essential to give them a chance to shine on that big day. If the flower girls are too young, make sure someone is attending to them throughout the wedding.